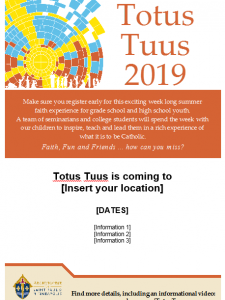 Totus Tuus (Latin for Totally Yours) is a fun and energetic parish based summer catechetical program, for both grade school age children and junior and senior high school youth. 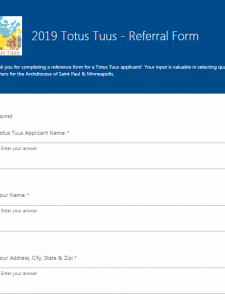 We gather together college students and seminarians onto teams of four in order to train them and send them out on the road to spread the Good News of Jesus Christ in various parishes throughout the Archdiocese of Saint Paul and Minneapolis. 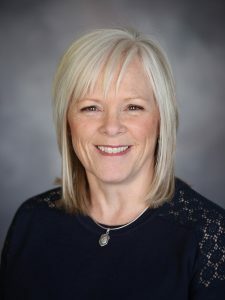 Their youthfulness, energy, and ability to witness to the faith make our teachers particularly effective with children and young people. 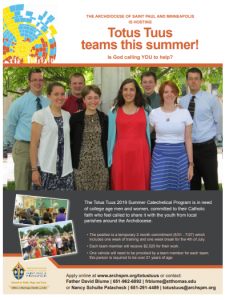 The team serves for a week in each parish, which includes the evening program for high school and junior high youth Sunday-Thursday (usually from 7:30 – 9:40 p.m., but can be customized to fit your parish needs). Our goal is to put the youth in contact with the Lord so that they can develop a deep personal relationship with Him. To this end, we have a night of Adoration and the opportunity for the Sacrament of Reconciliation, catechetical instruction on topics important to young people, and a night of fellowship with the team members. 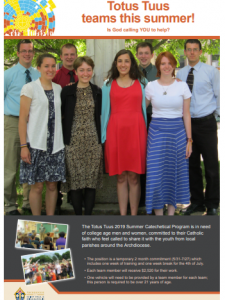 The team also presentd a grade school program (grades 1-6) that runs Monday-Friday from 9 a.m. – 2:30 p.m. Time is spent on catechetical instruction, songs, games, daily Mass, the opportunity for the Sacrament of Reconciliation, lunch, recess and more! The week ends with a large water fight with the children or a human (team member) ice cream sundae in celebration for the week. 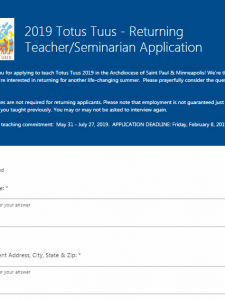 The focus is on imparting an understanding and love of the Eucharist, devotion to Mary, catechetical instruction, vocational discernment, and providing an enjoyable experience. 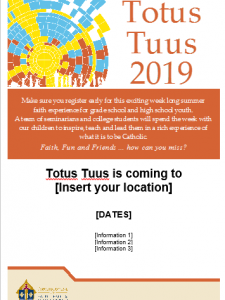 The Eucharist has pride of place in the Totus Tuus schedule, for both team members and participants. Prayer—the Liturgy of the Hours, the Rosary, the Angelus, the Chaplet of Divine Mercy and Adoration of the Blessed Sacrament—provide the structure, but the celebration of the Holy Sacrifice of the Mass is the “source and summit” of the daily schedule. 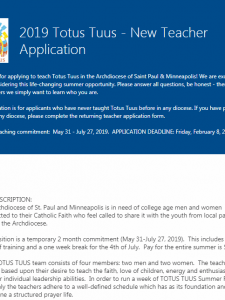 Totus Tuus catechists will lead the young people to Jesus for a week; however, Mary will lead them to Jesus for a lifetime. 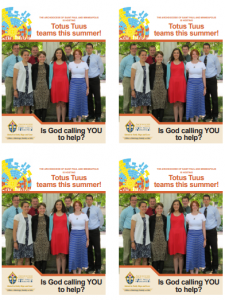 Therefore, Totus Tuus promotes Marian devotion. Meditating on the mysteries of the Rosary, we come to see how Mary always leads us to her Son. Praying with her and to her, we hear her say to us, “Do whatever He tells you” (John 2:5).